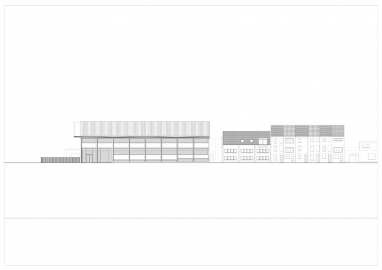 ‘The Ryhove urban factory is an example of how industry can fit in to the city. 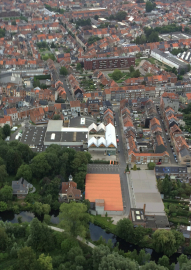 It brazenly exhibits its function and claims a prominent place for industry within the city limits, while blending in with the residential area. Skilled crafts people can find a place to work here, rather than in the city outskirts, far from where they live.’ (Mark Brearley). 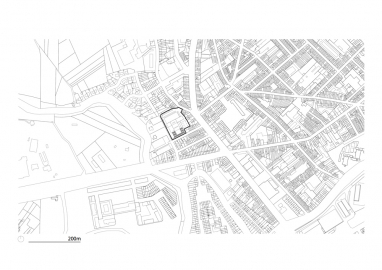 The Ryhove company owns a decrepit production site in the middle of a low rise residential area. After decades of gradual expansion, the sheltered workshop’s precincts have evolved into a tangled and inefficient conglomerate. Parts of the existing complex are demolished to make room for a new building. Its purpose: restructuring the site, organizing logistics and allocating supplementary office space, an underground parking and workshop spaces. Existing workplaces are rearranged and renovated. The site has been transformed into a well-functioning ensemble. 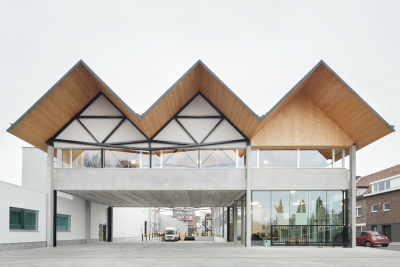 The building has a very direct relationship with the context, reinterpreting certain elements such as the the pitched roof shape. Industrial prefabricated building elements are assembled in an unconventional and explicit way so the scale of the building becomes more human and less industrial. 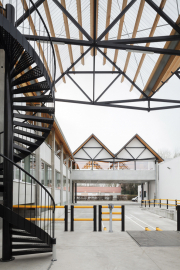 The first challenge was to come up with a new architectural language that represents an urban factory but is also considered acceptable in a residential neighborhood. The silhouette of the building plays a crucial role in this. 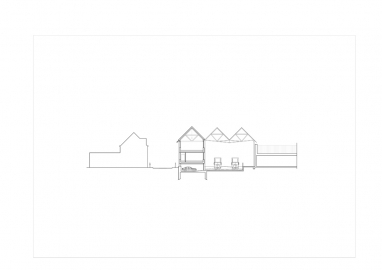 By taking the roof shape of the terraced house as a starting point, scaling it up and multiplying it, a hybrid building is created that combines the ‘bravour’ of an industrial building with the domestical character of a house. The second main challenge consisted of organizing the movements of trucks on the limited area. 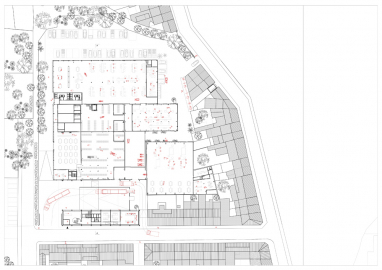 Therefore the new building revolves around a courtyard: the loading and unloading area. Here, finished products – the fruits of labour – are picked up for delivery. This place, where goods come and go, is not hidden towards the back of the precincts. Instead, it is located in the very heart of the company. The last main challenge was to design a specific and unique working environment. On this site the people are employed in a building that has nothing in common with a generic workshop or office building. 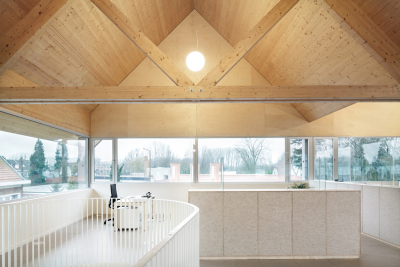 Instead the building offers both a domestic atmosphere – ‘it’s like working at home’ - and in close contact to the production process. The building’s structural elements – prefabricated concrete columns – are pushed outside, thus engaging them in an active dialogue with the context. 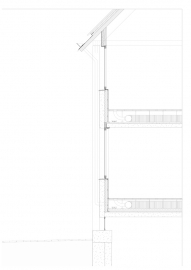 A bay measuring five metres, the size of a small terraced house, articulates a rhythm to the street façade. 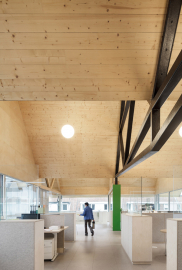 The building is topped off with a familiar gabled timber (CLT) roof, multiplied across the street’s length, bestowing industrial allure upon the building. Inside, the large scale recedes. 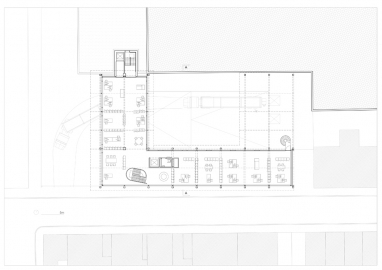 The workplaces are once again tailored to the size of a terrace house. 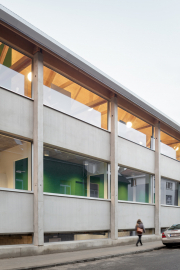 The radical choice to place the structure of the building outside, without cladding, and to make use of imperfect prefabricated building elements is a strategy that allows to create generous spaces with a limited budget. The rough materials are balanced by using softer materials such as felt, wood and linoleum flooring in the interior. All techniques are installed invisibly. Even the lighting is rather domestic, combining workplace lighting with spherical suspended luminaires. The simplicity of construction reduces the demand for maintenance. 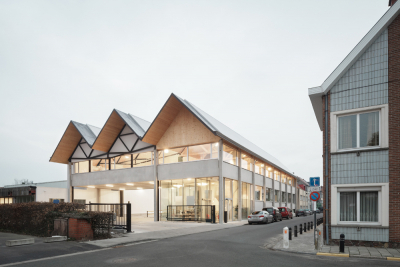 The building is easy to disassemble, so that in fact it becomes storage of building elements for future reuse.